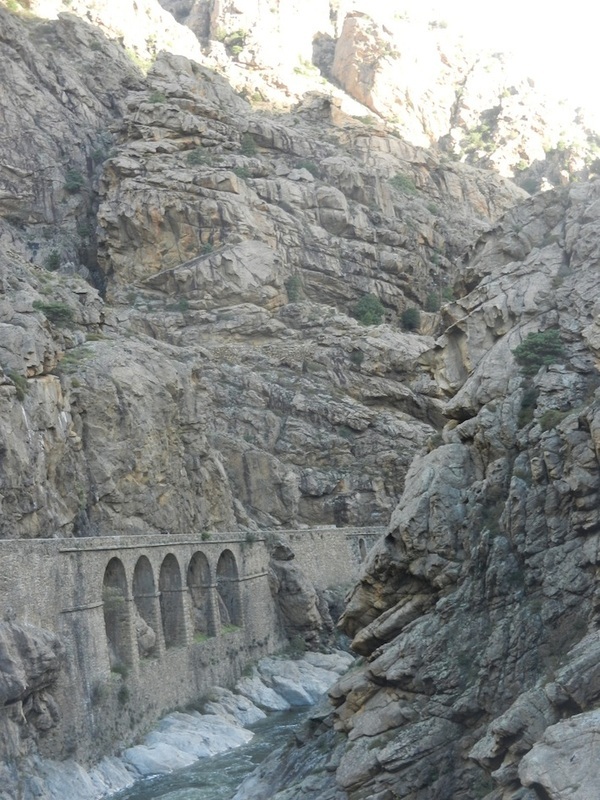 There is so much I could write about this ride along the D84 - kilometre deep rock gorges, sheer granite cliffs, forests with giant laricio pine and chestnut trees, mountain vistas, a long decent to the sea and a finish in a UNESCO world heritage site. It is a truly stunning ride and if you were to do just one ride in Corsica this for me would be it. Setting off from the small village of Francardo the route is virtually all on the D84 until Porto. You'll be ascending for a good while - about 40km - however the scenery is so dramatic you may not notice the climb! Look at the picture, can you make out the road sculptured from the granite cliffs? This granite corridor soon opens up in to the Niolo valley and more alpine style terrain and forest as you head towards the ski station at Col Vergio. High above to your right are Monte Cinto (2,706m) and then Paglia Orba (2,525m) which is easily spotted due to its dorsal fin like peak and to the right, Monte Albanu with the 'Cinque Frati" (the five brothers) granite towers. Calacuccia is the first main village you will come to and over on the left behind the barrage is the resevoir, Lac de Calacuccia. There is a lakeside road but our route sticks with the D84 and around 7km on there is a lovely spot, Ponte Altu. To the left is the old road and an impressive granite bridge, to the right the view up the stream to the mountains beyond make this a must for a photo stop. The next target 23km up the road is the Col Vergio which at 1,480m is the highest road pass on the island. You'll know when you've arrived at the Col. Apart from levelling out to the right of the road is a large staue perched on a granite igloo. The descent is exciting, down through the Forêt d'Aitone, one of the best you'll see on the island with its soaring Larico pines. Évisa is the next village and just as you enter over on the left is the Bar de Poste if you need a coffee or cold drink. Soon you'll drop away from Évisa and the road will turn back on itself for a little way heading east. Once you're heading west again the Gorges de Spelunca will come into view over on your right - all I need to say is wow (see my gallery). Your approaching the coast and the town of Porto. Rearing up from the sea beyond over on the left is Capo d'Orto (1,294m). It would be easy to stop this ride in Porto (and you could do overnight) but despite some further climbing (avg 6%/max 13% for 11km) you must head up to Piana via the spectacular D81 and the Calanches which form this UNESCO world heritage site. I'll say no more and let my pictures do the talking.